Pope John VIII can also refer to Pope John VIII of Alexandria. 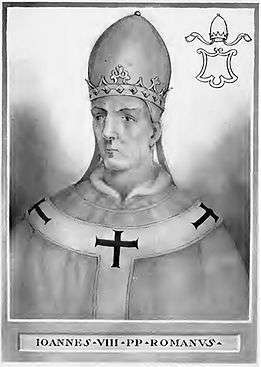 Pope John VIII (Latin: Ioannes VIII; died 16 December 882) was Pope from 14 December 872 to his death in 882. He is often considered one of the ablest pontiffs of the 9th century. He devoted much of his papacy attempting to halt and reverse the Muslim gains in southern Italy and their march northwards, which was "destroying the economy of papal patrimony." He was born in Rome and as a young man witnessed the Arab raid against Rome by the Muslim Aghlabids. 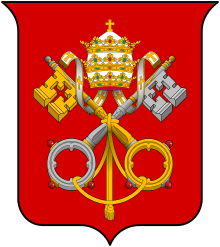 Among the reforms achieved during his pontificate was a notable administrative reorganisation of the papal Curia. He asked for military aid from Charles the Bald and later Count Boso of Provence, in response to Saracens who were raiding Campania and the Sabine Hills. His efforts failed and he was forced to pay tribute to the Emirate of Sicily. The threatening Muslim military presence (which he believed was God's punishment against "bad Christians"), coupled with alliances they formed with the local Christians, prompted John to promote "a new and uncompromisingly hostile view of the Saracens." This included a ban on forming alliances with the Muslims. However, his efforts proved unsuccessful, partly because Christian leaders viewed his calls for unity as an excuse to assert papal authority in southern Italy. In 873, John VIII learned of St. Methodius' imprisonment. Methodius had been imprisoned by his German enemies, who objected to his use of the Slavonic language in the liturgy. John forbade the celebration of Mass in Bavaria until Methodius was released. Following Methodius' release John allowed him to resume his episcopal duties in Illyricum, but forbid him to celebrate Mass in the Slavonic language. In 876, John VIII traveled throughout Campania in an effort to form an alliance among the cities of Salerno, Capua, Naples, Gaeta and Amalfi against Muslim raids. By 877, all five cities sent delegates to Traietto to formalize an alliance. In 879 he recognised the reinstatement of Photius as the legitimate patriarch of Constantinople; Photius had been condemned in 869 by Pope Adrian II. This was undertaken mainly to appease the Byzantines, since in them he saw the only hope of removing the Arabs from Italy. In 878 John crowned Louis II, king of France. He also anointed two Holy Roman Emperors: Charles II and Charles III. During the solemn divine service in St. Peter's church in Rome in 879, John VIII gave his blessing to duke Branimir of Croatia and the whole Croatian people, about which he informed Branimir in his letters. 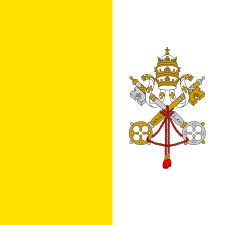 His country received papal recognition as a state. John brought the very decision on 21 May and confirmed it in his letter from 7 June 879. John VIII was assassinated in 882 - the first pope in history to suffer such a fate. The assassination has been blamed upon such factors as his exhaustion of the papal treasury, his lack of support among the Carolingians, his gestures towards the Byzantines, and his failure to resolve the Muslim problem. 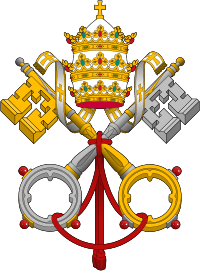 ↑ Catholic Encyclopedia, "Pope John VIII" page undated; retrieved 10 June 2007. ↑ Barbara M. Kreutz (7 Jun 2011). Before the Normans: Southern Italy in the Ninth and Tenth Centuries. University of Pennsylvania Press. p. 57. ISBN 9780812205435. ↑ Barbara M. Kreutz, Before the Normans: Southern Italy in the Ninth and Tenth Centuries, (University of Pennsylvania Press, 1991), p. 57. ↑ Pierre Riche, The Carolingians: A family who forged Europe, Transl. Michael Idomir Allen, (University of Pennsylvania Press, 1993), p. 203. ↑ The Expansion of Saracens:Africa and Europe, C.H. Becker, The Cambridge Medieval History, Vol.2, Ed. John Bagnell Bury, (The Macmillan Company, 1913), p. 387. ↑ John Victor Tolan; Gilles Veinstein; Henry Laurens (2013). Europe and the Islamic World: A History (illustrated ed.). Princeton University Press. p. 35. ISBN 9780691147055. ↑ Andrew Shryock (30 June 2010). Islamophobia/Islamophilia: Beyond the Politics of Enemy and Friend. Indiana University Press. p. 32. ISBN 9780253004543. ↑ Eric Joseph Goldberg, Struggle for Empire: Kingship and Conflict Under Louis the German, 817–876, Cornell University Press, 2006, p. 319. ↑ Eric Joseph Goldberg, Struggle for Empire: Kingship and Conflict Under Louis the German, 817–876, pp. 319–20. ↑ Barbara M. Kreutz, Before the Normans: Southern Italy in the Ninth and Tenth Centuries, (University of Pennsylvania Press, 1991), p. 58. ↑ Barbara M. Kreutz (7 Jun 2011). Before the Normans: Southern Italy in the Ninth and Tenth Centuries. University of Pennsylvania Press. p. 60. ISBN 9780812205435. ↑ John VIII, Pierre Riche, The Papacy: Gaius-Proxies, Vol. 2, ed. Philippe Levillain, (Routledge, 2002), p. 837. ↑ Stjepan Antoljak, Pregled hrvatske povijesti, Split 1993, str. 43. ↑ Barbara M. Kreutz (7 June 2011). Before the Normans: Southern Italy in the Ninth and Tenth Centuries. University of Pennsylvania Press. pp. 59–60. ISBN 9780812205435. Wikimedia Commons has media related to Pope John VIII. "Iohannes VIII papa". Repertorium "Historical Sources of the German Middle Ages" (Geschichtsquellen des deutschen Mittelalters).